In part 1 of this article, we began an examination of how active involvement in AA can help a person win a Driver’s License Appeal.In this 2nd part, we’ll pick up with some more examples of why this is the case. Within the body of my various License Restoration articles, I have written a lot about how I prepare my Client for a Driver’s License Restoration Appeal. All of that preparation is put under the spotlight on the day of their actual License Hearing. During the Hearing, I have a number of jobs to do simultaneously. Amongst them is paying attention to my Client’s answers to the Hearing Officer’s questions. This helps me determine, what, if any questions I ask my Client when I subsequently re-examine them. In the larger picture, this helps me control the impression that is ultimately made at the Hearing. A few years ago, I was sitting in a Hearing with a Client who was an active AA participant. This man credited the program with not only bringing him to sobriety, but also saving his life. During the course of the Hearing, he was asked by the Hearing Officer to talk about a step or steps, other than the 1st, that were particularly important to him, and to explain why. I felt a surge of satisfaction run through me, as I knew this guy could step up and hit this one out of the park. 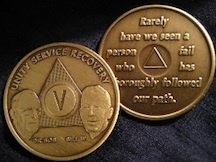 “A lot of people talk about AA as being a 12 step program, but the truth is that it’s more like one big jewel, which is really the 1st step, with 11 facets to it.” At this point, I was wishing I could kick him under the table, but in the Hearing Room, there’s no way to do that without being seen. I struggled to keep a straight face, all the while feeling like our Appeal was dropping like a rock. I felt somewhat relieved that the Client had explained himself this way. Just moments before, I thought we were about to crash and burn. As I looked up, I felt even more relief as I saw the Hearing Officer smile and nod. The end result was that the guy won his Appeal. I’m sure his “version” of how AA works would have generated some debate at the tables of any meeting. Some might disagree with his analysis, some might try and “correct” him, and yet others would find his assessment confusing. From my point of view, what did any of that matter? The only thing I was concerned about was how the State perceived him, and his unusual analysis. I came to realize that the Hearing Officer was not interested in judging or evaluating his program, but rather in determining if he had one. Put another way, the Hearing Officer realized that whatever this guys analysis, he could not have possibly come up with it if working the steps was not part of what he did. His analysis of the 12 steps, however “accurate” or not, was the product of working the program, and thinking it through. This underscores how a person active in AA will have an advantage over anyone who is not in the program. Even if the non-AA person is totally immersed in an alcohol-free lifestyle, they simply won’t have spent nearly the amount of time talking and thinking about all the aspects of that as the person in the program. As a consequence, much of what I’ll be doing with them is helping them create the story of their recovery. For someone involved in AA, my efforts are far more directed toward helping them edit and revise that story. Going back to the big issue in a License Appeal, that “The Petitioner’s alcohol problem…is likely to remain under control,” it becomes clear that what’s really being examined is whether a person in AA really “gets it.” Are they the kind of person who fundamentally accepts the progressive nature of the disease of alcoholism, or do they mistakenly think there will come a time when they will somehow be able to have a drink? Within the plethora of clichés that circulate in the AA world, there is one that calls the disease of alcoholism “cunning, baffling, and powerful.” As I’ve come to understand this, it means, amongst other things, that the alcoholic has the only disease known to man that tells them they don’t have it. This means that 2 or 3 years down the road, the alcoholic, while intellectually knowing they can’t drink again, will hear that “little voice” in their head that tells them its okay to have a glass of wine, or a glass of draft beer. Their “stinking thinking” rationalizes that they are somehow different than everybody else, and that they can, if they try, have just one drink. The alcoholic who truly “gets it” learns to ignore that voice. He or she learns that such a voice comes from the same place as the one, when they lean over the edge of someplace high up off the ground, that says “jump.” Being committed to sobriety is learning to let that voice just fade into the white noise of life, and not letting it have any distinction. The DAAD knows all about this. They’ll be inquiring into the depth of understanding and commitment a person has to the notion of abstinence as the only way to recover from a drinking problem. Anyone in AA will be able to address this in considerable detail, and those that really “get it” will leave no doubt of the strength of their belief. If the focus of the Hearing Officer’s inquiry is in determining if “The Petitioner’s alcohol problem…is likely to remain under control,” then the first step in answering that question is to prove one’s commitment to not drink again. Beyond that, however, is the need to demonstrate why that commitment is not tenuous, and why it will last the rest of the person’s life. This is where those in AA really have the advantage. This is where steps 2 through 12 come into play. A person may credit finding the program with leading them back to a sense of spirituality that they find sustaining. Another person may credit the program with giving them the ability and insight to admit when they’re wrong, rather than blaming others and further compounding a situation. Someone else may find that being a Sponsor helps reinforce their sobriety. Whatever step or steps a person points to, the idea here is that they have an ongoing relationship with the program and its steps, which will help sustain their sobriety. If there’s a scary part about the License Restoration process, its that it involves loads more details than just the person’s recovery story. Beginning with the Substance Abuse Evaluation, there are countless little things than can go wrong. Managing that, however, is the job of a License Restoration Lawyer. This allows the Client to let the Lawyer put the evidence together and worry about those details. This, in turn, allows the Lawyer to help the Client concentrate on framing their recovery story in terms that will result in prevailing on those issues being examined by the DAAD Hearing Officer. And it’s a fitting conclusion to this discussion that most AA meetings end with the Serenity Prayer. If a person really approaches this whole process with the serenity to accept those things which they cannot change, the courage to change the things they can, and the wisdom to know the difference, then they’ll be far more relaxed as their Lawyer guides them through the maze of a Driver’s License Restoration Appeal.